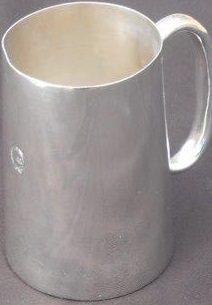 Lot 147 LMS 5" Silver - Plated - One Pint Tankard by Mappin & Webb. The sloping side is clearly marked with the Midland pattern "LMS Hotels" laurel wreath crest 4 3/4" tall. Replated to very good condition, if a little wavy at the rim.